Crown is one of the world's principal lift truck makers and progressive design leaders of IC forklift trucks for indoor and outdoor uses. 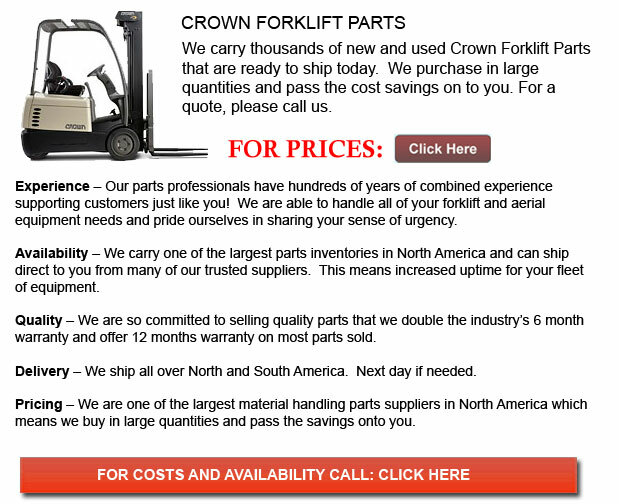 Crown specializes in electric forklifts used in delivery centres and manufacturing environments worldwide. Though a privately owned business, Crown has wide-ranging production capabilities across the globe with factories stationed in China, the United States, Mexico, Germany and Australia. Crown's electric lift trucks are utilized daily to securely ship warehouse cargo and resources. The company's comprehensive product line consists of power pallet trucks and stackers, narrow-aisle turret trucks, counterbalanced trucks (sit-down and stand up models), manual propelled pallet trucks and stackers, order picking equipment and narrow-aisle reach trucks. Environmental management and sustainability are an extremely influential part of the Crown culture. Decades of thought leadership have enabled Crown to assist clients whilst improving the natural environment. ISO 14001 certification has been attained for business management and environmental efforts in manufacturing. Crown has proudly achieved several awards and recognitions for its sustainability efforts, including the Ohio Governor's Pollution Prevention Award and the Ohio Governor's Environmental Sustainability Award. Crown Equipment Corporation was started in the rural American community of New Bremen, Ohio, USA. The company has developed from a one-room outfit into an internationally renowned organization, currently considered to be the 7th largest lift truck manufacturer on the planet. The Crown corporation was founded in 1945 by two brothers, Allen A. Dicke and the late Carl H. Dicke. Carl's son and Chairman Emeritus, James F. Dicke, joined the family company later that same year. Presently, his son, James F. Dicke II, is Chairman and CEO. James F. Dicke III, serves as the company Head today, becoming the fourth generation of the Dicke descendants to uphold this position. Now an globally diversified company, Crown first manufactured temperature controls for coal burning furnaces, servicing a small clientele. The production of these control units took place in a former hardware store stationed in New Bremen, Ohio, where Crown's center of operations currently remain. In 1949, responding to the public's rising interest in television, Crown shifted into the manufacture of antenna rotators. This product was used to improve television reception and image quality. The company's successful move allowed them to become a leading manufacturer of units until 2001. The company ceased production in October after a decline in the global demand for TV antenna rotators. In the early 1950's Crown diversified into the manufacturing and repair of electronic and mechanized machinery for government and private market. Following several successful bids inside a short period of time, the company had built a highly regarded business in this field. Adaptability and achievement dominated Crown's capability to diversify once again. In 1957, production into the material handling industry began with forklift manufacturing. The organization believed the market needed a smaller line of top-quality quality forklifts. Crown promptly created an exceptional range of contemporary equipment and swiftly became the most rapidly evolving material handling company with its variety of merchandise. By 1966, Crown had ventured into the overseas materials handling marketplaces by opening up shop in Sydney, Australia. Sydney is at this time a regional center of operations for Crown for all Pacific Asian sales, marketing, and services. Crown remains an unwavering market leader today, supported by exceptional service, solid sales and solid production operations. Two years later, Crown had moved into the European marketplaces by buying up an Irish production plant from a German Company, Steinbock. There they began to make PTH hand pallet trucks. Later on that same year, Crown began their first London operation stationed nearby Heathrow Airport. The sales and service operation of Crown's comprehensive lift truck line was offered in the UK by the end of the decade. In the early 1970's, Crown expanded and began marketing and advertising lift trucks across Europe through independent dealers. These days, Crown manufactures a huge fleet of electric forklifts. The company's vendor network, stationed in key international markets, consists of both Crown-owned and independently-owned sellers. They are responsible for managing the company's product sales and service. Corporate offices in New Bremen, Ohio and Munich, Germany provide national advertising and promotional sales support to all seller and sales personnel. Both Crown sales and seller personnel are factory- trained in all disciplines to guarantee the utmost reliability and service. The Munich office was launched in the 1980's and delivers purchasing, marketing, engineering and design functions for India, Africa, the Middle East along with Europe. The diverse family of international dealers and Crown-owned sellers successfully operate in almost 100 overseas city environments. Crown has established 6 manufacturing locations in the United States that consist of: New Knoxville; Celina, Ohio; Greencastle, Indiana; Kinston, North Carolina; Fort Loramie, Ohio; and New Bremen, Ohio. Serving their growing foreign markets, Crown has manufacturing facilities in Sydney, Australia (since 1966); Queretaro, Mexico (since 1973); Roding, Germany (since 1986); and Suzhou, China (since 2006). Crown also owns branch sales and service center operations in over 30 locations in the USA. International branch sales and service center operations consist of locations in Singapore, New Zealand, the Netherlands, Korea, Malaysia, England, Germany, Belgium and Australia. Through its numerous clientele on all sides of the world, Crown has built an outstanding reputation as a maker of forward-thinking, safe and reliable machines. The company has been awarded more than 50 distinguished design awards and the products that Crown develops continues to attain recognition for innovation and top design excellence. To provide an example, in the 1970's, Crown's launch of the side-stance design proved exciting and unparalleled by materials handling experts. Today, this design has gained popular acceptance and earned a Design of the Decade award from the International Design Society of America. Again, more than thirty years later, the 5200S Series Reach Truck is another market first, providing the operator with several comfort options to lean, sit or stand, along with its unparalleled output capability.